Princess Elisabeth Station’s 10th Anniversary – W.A.P. Febr. 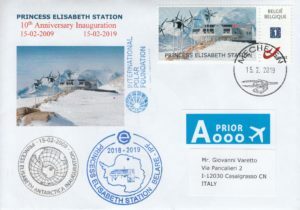 15th marks the 10 years anniversary of the inauguration of the Belgian Princess Elisabeth Station in Antarctica (15 Febr-2009 _ 15 Febr-2019). The link between Belgium and the Antarctic has always been strong since the first overwintering of the scientific expedition led by Adrien de Gerlache from 1897 to 1899, passing through the construction of the King Baudouin Base (WAP BEL-Ø1) in 1958 and Belgium’s participation in the Antarctic Treaty negotiations in 1959. This link reflects the close cooperation that exists between the challenges of exploration and scientific research on this continent of extremes. The construction of the new Belgian Polar Research Station, Princess Elisabeth (WAP BEL-Ø2), the fruit of the indefatigable will and energy of Alain Hubert, a man who takes up any challenge, together with the enthusiastic engagement of the Federal science policy and the indispensable financial support of private partners willing to contribute to this scientific tool, is a modern example of how coordinated action can ensure the success of advanced research. Thanks to Mr. Eddy de Busschere, Secretary of the Belgian Polar Exploration Society (BPES) for sending a nice gift from Antarctica; a stamped envelope with covers to celebrate the 10th Birthday Anniversary of Princess Elisabeth Station.